Inland Building Systems is a manufacturer of “custom concept” systems constructed buildings. As a Schulte Building Systems Company, we rank annually within the top companies in sales volume in the metal building industry. Our unique single source supplier philosophy allows us to design, fabricate, and deliver most any type of low-rise building structure to anywhere in the world. Based in Cullman, Alabama, Inland Building Systems began producing projects over sixty years ago. To date, we have supplied buildings to all fifty states and in over thirty foreign countries. Our facility expands over 200,000 square feet of manufacturing/storage area and 40,000 square feet of office space. Our employees, backed by years of experience, can produce virtually any type of building for your building projects. We pride ourselves in producing a design-functional, aesthetically pleasing, superior quality building that is known for its ease of erection and adaptability, as well as being backed by unparalleled customer service. In today’s chaotic steel construction market, a service-oriented company is an oddity. That is what separates Inland Building Systems from the rest of the market. Inland Building Systems is a charter member of the Metal Building Manufacturers Association. This affiliation promotes the use of system-constructed projects throughout the world. We have also met the stringent criteria set forth by the International Accreditation Service Approval and are IAS certified to assure you that every project with which we are involved is uncompromised, from procurement of specified materials to design and fabrication of the final product. Some of our nationally recognized past and current customers include companies such as Coca-Cola, Ford Motor Company, Anheuser-Busch, Federal Express, United States Armed Forces, Standard Oil, Georgia-Pacific, and Kimberly Clark. These companies and a vast array of others come to Inland Building Systems time and time again because they know that our building systems stand the test of time. With a product line that is second to none in our industry, contractors, architects and end-use customers expect nothing but the best from Inland Building Systems, and that’s what we deliver! The best quality, performance and product you look for in a manufacturer. From initial inquiry to final project punch-out, Inland Building Systems takes control and schedules projects for on-time delivery. We welcome inquiries that may challenge other manufacturers, but fall within our core competencies. On your next project that involves system-constructed products, Test Our Capabilities . . . give Inland Building Systems a call! 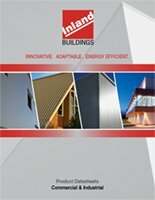 You can contact Inland Building Systems at 800-438-1606 or e-mail sales@inlandbuildings.com.